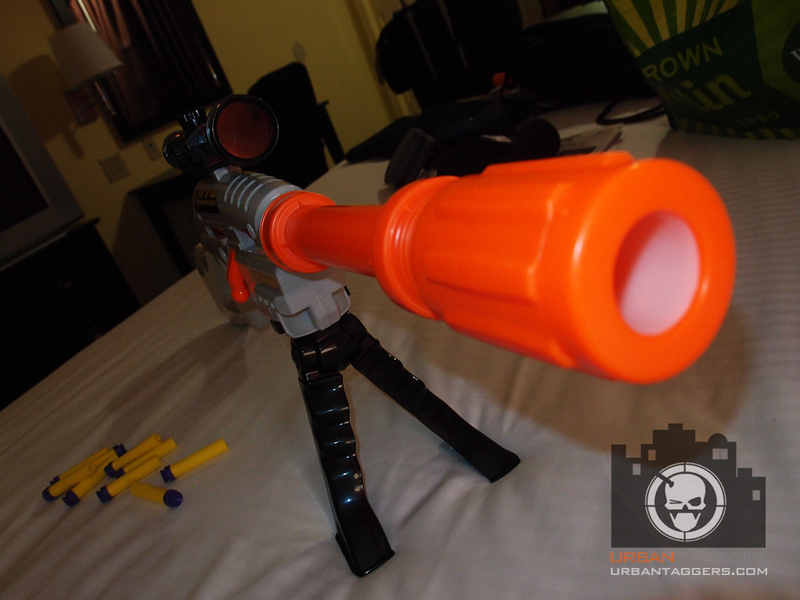 Just another image of the rumoured Nerf N-Strike Elite Pinpoint Sight. So far, the majority of rumours we post tend to be true, and I'd suggest this one is gonna happen- it makes sense anyway:) Thanks for the intel Jessie; apparently it was spotted on Chinese forum Baidu and possibly available on Taobao. UPDATE: more pics have been posted on Baidu- you can see them after the jump. Thanks Jason! Clearly, she's done this before.. never. 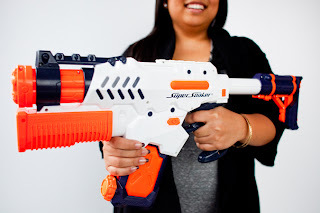 I was standing in the toy gun aisle in a Target the other day while I overheard a conversation a man was having with what I think was his gf/wife about Super Soakers. 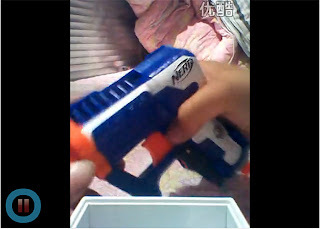 He picked up a Thunderstorm box and showed it to her and said "I got me two of these, Fully automatic madness. I'm gonna totally own Dan's kids next time we have a water fight"
She seemed suitably impressed and said the customary grown up thing to say of "they look so dangerous, so different to when WE were kids" and thought he was an all round wacky kinda guy. I just looked at them in horror, quietly shook my head and thought to myself "lightweight":P Are you serious? 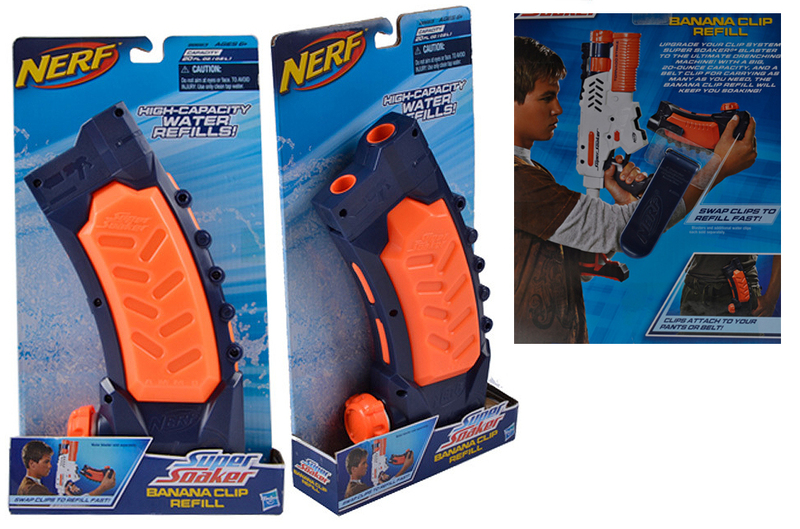 Water guns when you were a kid would totally destroy two Thunderstorms. How many times has this happened to you when you hear someone talk about toy blasters like they're an expert but really, they have no clue and you can't help but think they're a total noob? Yup, that's how I felt. And then I realised. Dear god, I am a blaster snob..
Nerf footballs are nothing new; they've been reinvented and refreshed many times over the years, but here Nerf have done something rather new indeed and brought out a new night time specific line called 'Fire Vision'. We've heard of them for a while now, and finally on my travels I decided to revert back to my childhood and pick up another football, only this time, it comes with 'eyewear'..
GIJoe Blade of Justice: N-Force by an other name.. I don't really get into N-Force that much, though I still wait for the day they'll release Nerf N-Force Nunchuks:) Still, the increasing popularity for melee gear from my com padres at the Canberra and Southern NSW Dart Tag crew has had me on the look out for such items. 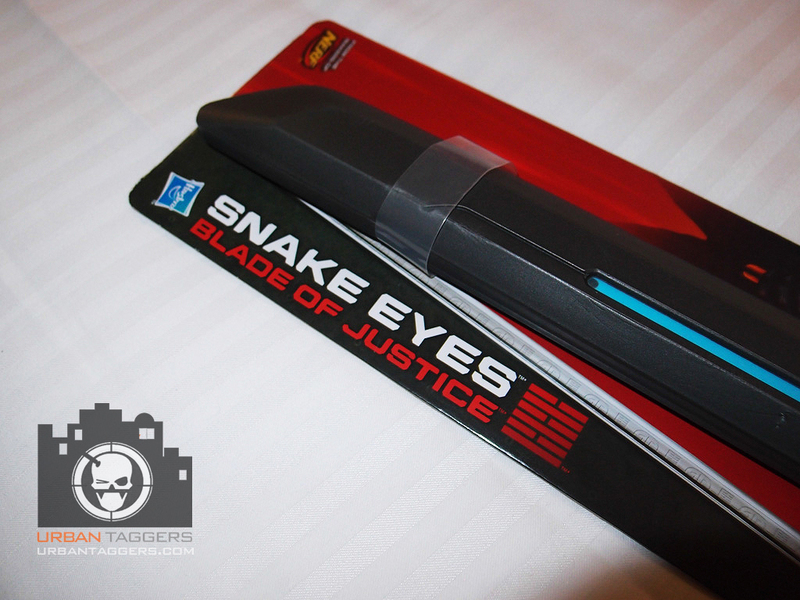 While not strictly N-Force, this rather cool looking GI Joe branded "Snake Eyes Blade of Justice" sword IS by Hasbro and does say "From the makers of Nerf" so really, it's just an N-Force sword for all intended purposes. More pics after the jump. 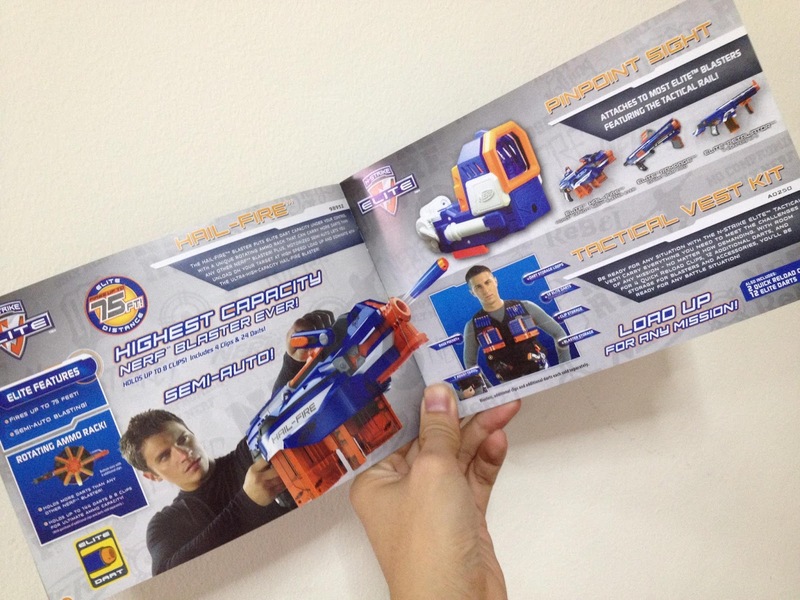 One of the dark horse blasters that have popped up this year is the Buzzbee Range Master. I'd only read about them to date, as so far (at least from what I know) they're not available in Australia but have been generating quite a bit of 'buzz' (hehe) in the US given the unique firing mechanism and impressive ranges. 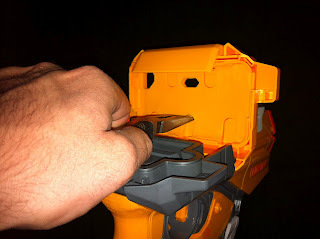 I raised an issue about the new LTAR blasters with the somewhat permanent nature of the iPhone/iPod Touch housing attachment in my earlier review, and Skurj over at The Hive Mind has posted his solution. Boom! While this is great that this can be done, the manual does specifically say "permanent" once you attach it, and I am not sure Hasbro can really rely on all of their users doing this without potentially busting their housings/blasters in the process. You probably wouldn't want to keep doing this every time you opted to mount your device. Lazer Tag Augmented Reality: But the reality is..
We've heard of Hasbro's new re-entry into the home laser tag market with the all new Lazer Tag "Augmented Reality" line for a while now, and while on my trip to California I was happy to pick up a pair on my travels to review while on the fly. I've had mixed views on these bad boys since they were first announced; my main gripe being the reliance on an Apple iphone or iPod Touch device. 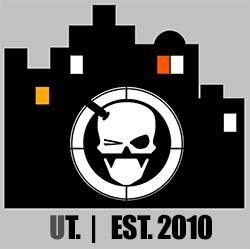 I was however given hope by my well respected learned friend and fellow blogger Bazookafied of Tactical Tag (who pretty much is the man when it comes to laser tag) who let me know these new taggers' key functions fine without any need for an iPhone. I gotta admit when the Vortex line came out, the biggest aesthetic gripe I had over it was the colour scheme. I have a feeling they wanted to give it a more "alien" feel but the green was not.. nice- more of a shade of sick rather than anything else. The surprise colours of the Pyragon were sweet eye candy for me, even though many thought the design was essentially a Praxis.. but how sweet did it look in white? 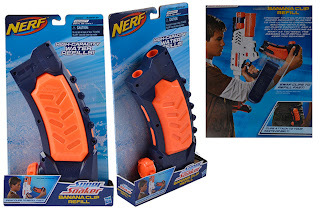 Traditionally, 9-9-12 is the date Nerf have been publicising for the official launch of their new products/lines; in this year it's the N-Strike Elite gear and namely, the flagship Hailfire. We in Australia tend to get products.. whenever it's convenient for distributors so I was curious to see what it'd be like to be here in the US on the day that's such a big deal for Nerfers everywhere. 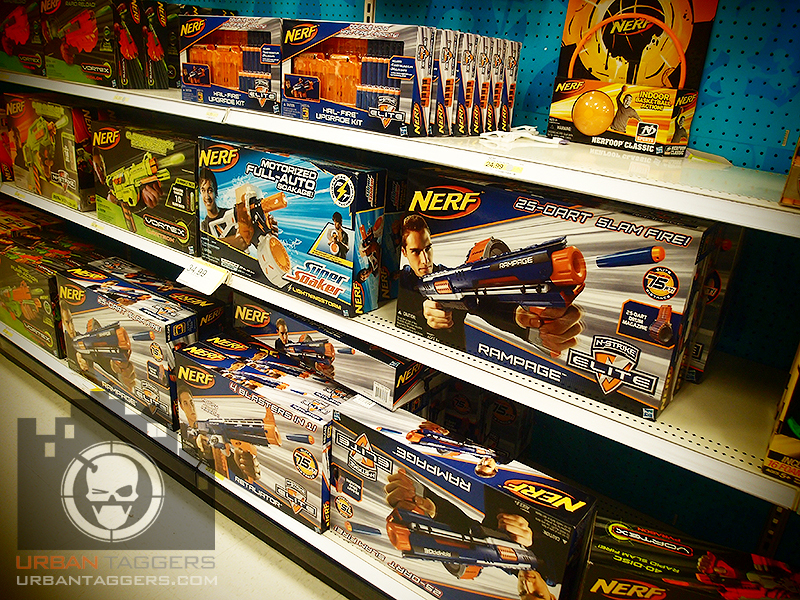 So on the 9th September, I went and checked out a Target located down in Los Angeles to see what was on offer in the blaster aisle.. I admit I was a tad underwhelmed. 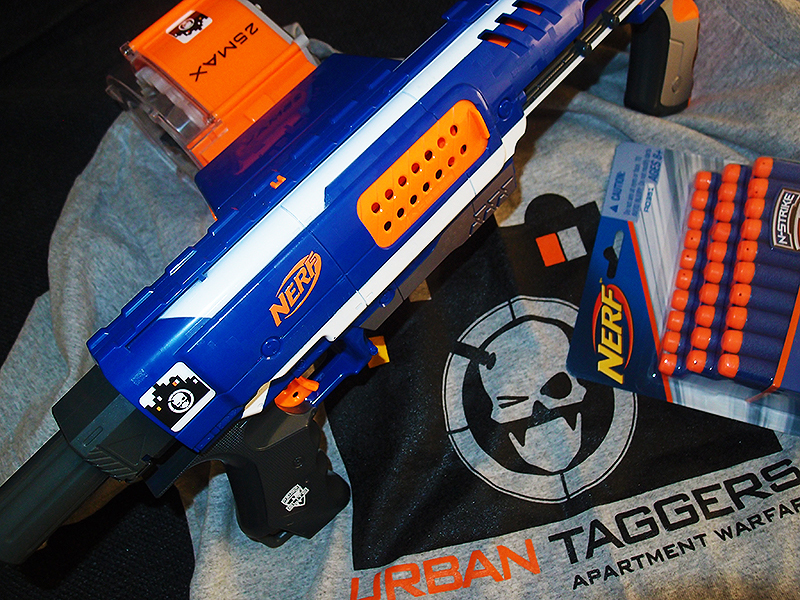 Maybe I chose a quiet Target..
Urban Taggers vs Basic Nerf BOOM! I came to the US obviously unarmed, but just picked myself up some brand new gear today that I shall be giving away to someone tomorrow night at the end of the game. Want my new N-Strike Elite Rampage? How about the shirt off my back? (ok I won't be wearing it, it's a new one but it sounds better this way) well come to El Monte tomorrow night and come take it off me! Rumours: Super Soaker Banana Clip!? Apparently it's called the Triad EX-3 and is that Elite "Jolt" we've been all coo-ing over. 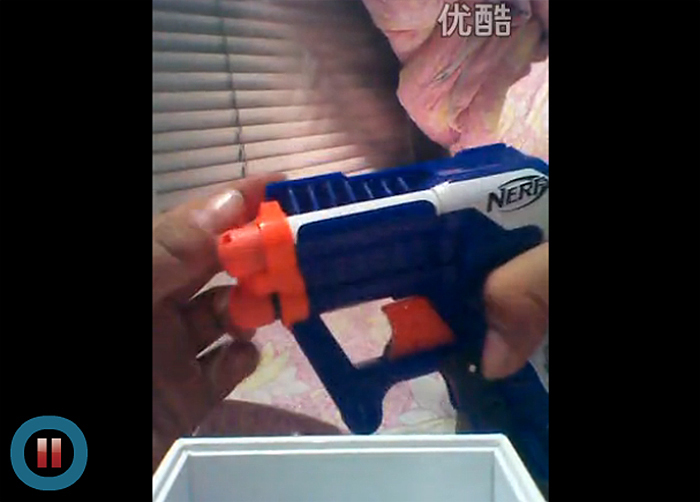 Why it's called the Triad is it looks to hold THREE darts(albeit only shoot one) ; and it looks pretty tough too. 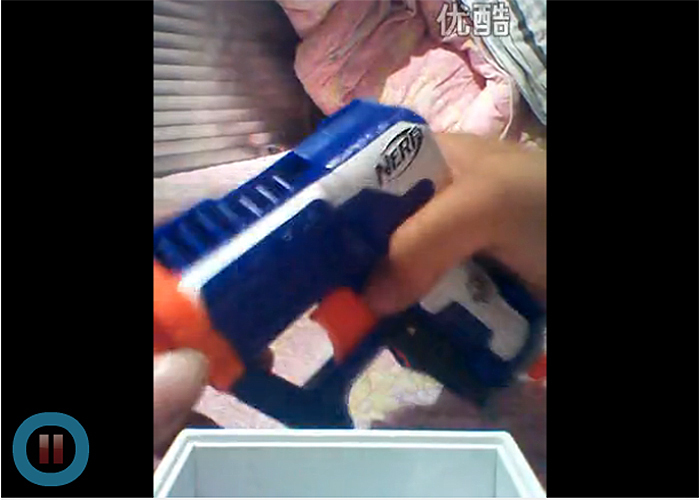 There's a video from youku after the jump- of course it's in chinese and the fella who owns the gun is obviously pretty young, but it gives you a good idea. Cheers Jason for the lead! 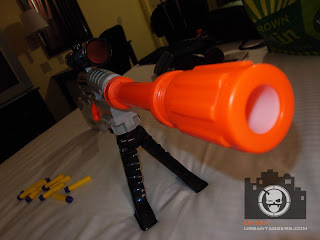 Rumours: Nerf Elite Pinpoint Sight? You do have to hand it to Nerf for listening to their fans. 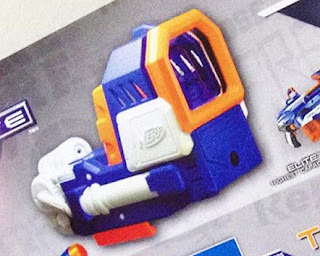 As seen on the Nerf Dart Tag Tournament Malaysia Facebook Page, the much coveted Pinpoint sight looks to finally soon be re-released, and in the new Elite colour scheme to boot. 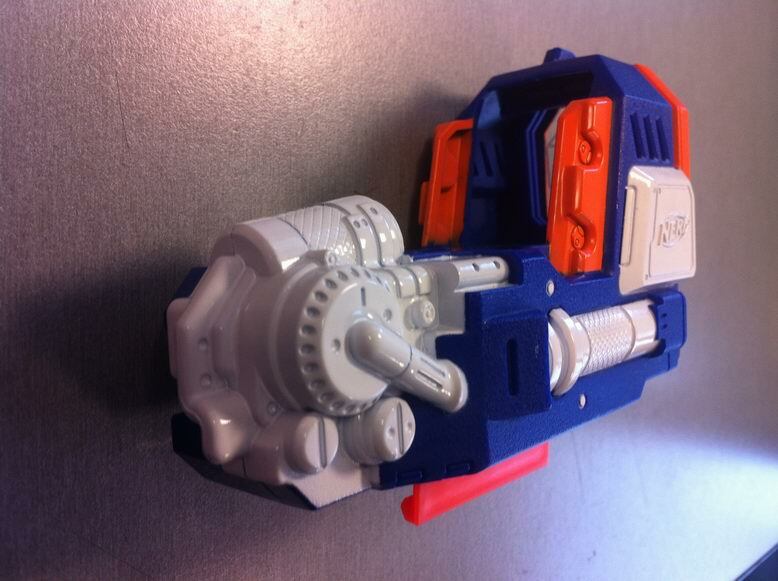 Which does look sweet.. if you're a fan of the new elite colour scheme (and don't just paint your blasters anyway).